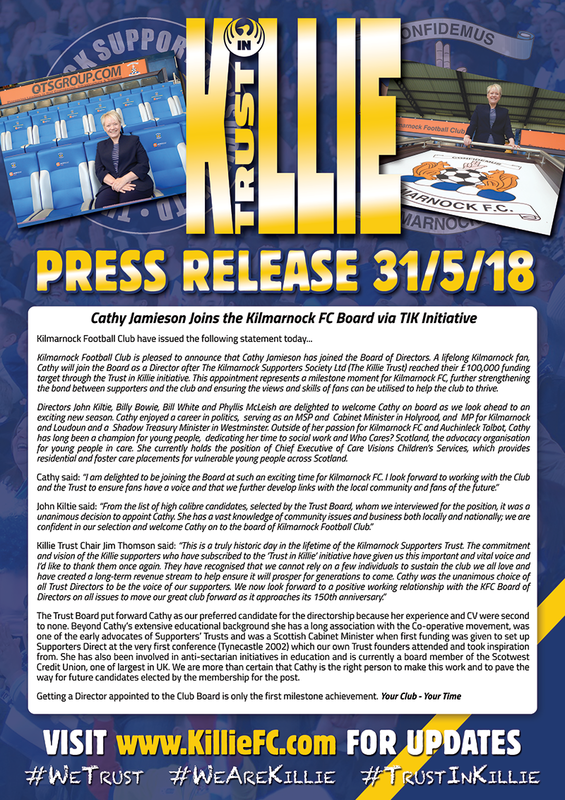 Kilmarnock Football Club is pleased to announce that Cathy Jamieson has joined the Board of Directors. A lifelong Kilmarnock fan, Cathy will join the Board as a Director after The Kilmarnock Supporters Society Ltd (The Killie Trust) reached their £100,000 funding target through the Trust in Killie initiative. This appointment represents a milestone moment for Kilmarnock FC, further strengthening the bond between supporters and the club and ensuring the views and skills of fans can be utilised to help the club to thrive. Directors John Kiltie, Billy Bowie, Bill White and Phyllis McLeish are delighted to welcome Cathy on board as we look ahead to an exciting new season. Cathy enjoyed a career in politics, serving as an MSP and Cabinet Minister in Holyrood, and MP for Kilmarnock and Loudoun and a Shadow Treasury Minister in Westminster. Outside of her passion for Kilmarnock FC and Auchinleck Talbot, Cathy has long been a champion for young people, dedicating her time to social work and Who Cares? Scotland, the advocacy organisation for young people in care. She currently holds the position of Chief Executive of Care Visions Children’s Services, which provides residential and foster care placements for vulnerable young people across Scotland. The Trust Board put forward Cathy as our preferred candidate for the directorship because her experience and CV were second to none. Beyond Cathy’s extensive educational background she has a long association with the Co-operative movement, was one of the early advocates of Supporters’ Trusts and was a Scottish Cabinet Minister when first funding was given to set up Supporters Direct at the very first conference (Tynecastle 2002) which our own Trust founders attended and took inspiration from. She has also been involved in anti-sectarian initiatives in education and is currently a board member of the Scotwest Credit Union, one of largest in UK. We are more than certain that Cathy is the right person to make this work and to pave the way for future candidates elected by the membership for the post.